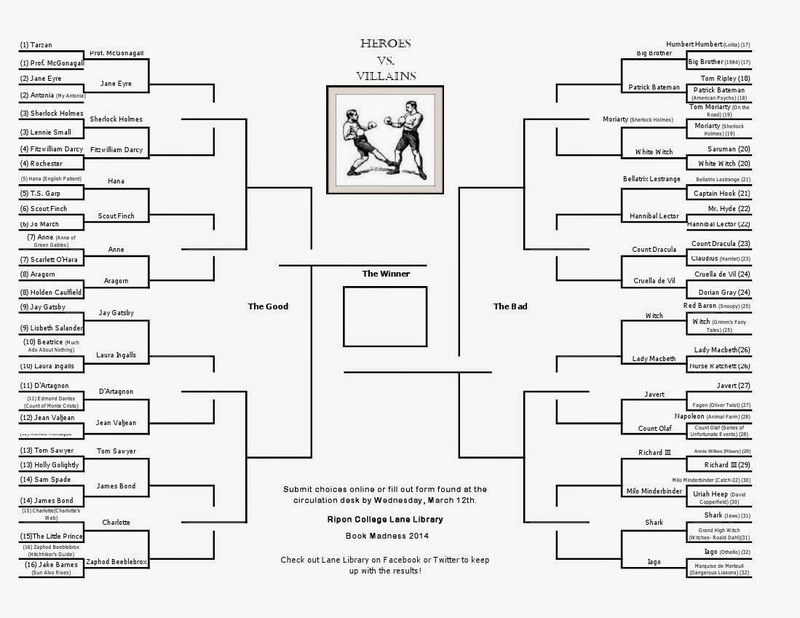 How did your first round choices do in our literary March Madness? Voting is now open until Wednesday for round two at http://bitly.com/1lGbaGz for your favorite literary heroes and villains. We are now down to 16 heroes vs. 16 villains, and the match-ups continue to be intriguing, if not down right strange. Who will get your vote between Tom Sawyer or James Bond? Do you think Hannibal Lector would get the better of Bellatrix Lestrange? It is up to you to decide. If you want to see the bigger picture as to which Heroes and Villains reigned supreme in the early rounds, get your glasses out again for the updated brackets below. Second round voting will continue through Wednesday, March 12th, and our next winners will be announced on Thursday, March 13th; stay tuned to our Facebook and Twitter pages for updates. Have fun with it, be sure to put in your two cents, and we will have our Sweet Sixteen announcement before Spring Break!